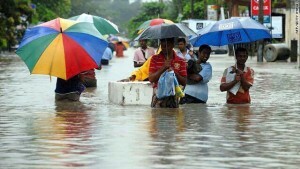 Floodwaters and landslides in Sri Lanka have forced hundreds of thousands of people to leave their homes, report agencies. At least 37 people have died and 21 are missing after three days of incessant rains and destructive landslides. “As Salesians we are here to help the people in desperate need although we ourselves are also suffering just as much as the people in general,” says Fr Joseph Almeida, provincial of Salesians in Sri Lanka. The Colombo-based Disaster Management Center says 223,687 people have been affected by the floods and landslides. Some 200,000 people are currently being housed in hundreds of welfare centers across the country. Emergency workers have been rescuing people trapped in their homes by rising waters. Fields and streets are submerged throughout the country. The Salesian provincial says they are now busy providing relief and basic necessities to these flood victims. “We need your heartfelt prayers especially during this difficult period. Please pray for the people of Sri Lanka,” the provincial wrote to all his conferrers around the globe. Salesians institutions in the North and Western Provinces now feed children and youth in their boarding houses. “We are hoping and praying that the weather condition improves before we run out of food for the children in the boarding. It is only after the weather improves and the floods recede that we would be able to access the amount of damages and loses that have been caused by the floods and gale to our institutions,” Fr Almeida writes. He says the Salesians and their students are waiting for the floods to recede to launch relief operations. They plan to distribute rice, clothes, potable water, hygiene materials, bed sheets, mattresses and other materials to those seriously affected. “We ask for your generous support and donations in these trying times so that, together, we can help alleviate the plight of the flood victims,” the provincial pleads.